Robert Shaw rendering of the first Brandywine Springs Hotel in 1909. The Marhsall family gathering at Brandywine Springs in 1914. The second hotel, built after the first burned in a fire in 1853. Jabez Banks in front of the second Brandywine Springs Hotel. Brandywine Springs Park in New Castle County may look like a common park, but it has a rich – and unique - past: as both home to natural springs and an old historic amusement park during the late 1800s and early 1900s. Delaware Public Media’s Megan Pauly takes us back in time to learn what the park was like then in this month's History Matters, produced in collaboration with the Delaware Historical Society. Delaware Public Media's Megan Pauly unearths some of Brandywine Springs Park's forgotten past in this month's History Matters. Standing with Mike Ciosek – President of the group Friends of Brandywine Springs – near the park’s parking lot, the scenery at first glance seems simple. There’s a picnic gazebo and a fairly large stretch of green grass that leads to a row of trees. But after a tour behind the trees and down the hill by the Red Clay Creek with Ciosek, it becomes obvious that there’s so much more to this park than meets the eye. The history of the Brandywine Springs Park goes back many decades to a time when local Indians frequented the iron and sulfur-rich mineral Chalybeate Springs believed to have medicinal qualities and cure ailments. “Taking of the waters was very popular, and there were Saratoga Springs and a number of springs up and down the East Coast, and this was just one of them,” Ciosek said. “It was what you’d call, I guess, something really to see,” Ciosek said. It sat squarely on the area that’s now occupied by the park’s parking lot, a discovery made by Gene Castellano, who has been researching the historic springs – and the hotel – for over 30 years. “I used to go looking for mineral spring hotels in New England, Saratoga Springs, so it was a topic of interest,” Castellano said. He was surprised to eventually find out that Delaware had mineral springs as well, but had a hard time finding much information about them. “And so for me, when I can’t find something that usually puts me in a detective mode and I want to start looking for what was there,” Castellano said. The effort eventually became part of his preparation for pursuit of a master’s in history. After a long career at DuPont and W. L. Gore and Associates, Castellano went back to school to study history and museum studies. "I called it my digital excavation of Brandywine Springs," Castellano said. "I was taking old maps, computerizing them, overlaying them on modern maps, and in this overlay process the location of the hotel started to show itself." Castellano was able to draw historical conclusions about the hotel from watercolor paintings, since its existence predated photography. Depictions from lawyer, artist and political cartoonist Edward Williams Clay were among those to document the hotel. “He gives us this wonderful view of Brandywine Springs, it shows people milling out and about, a very wealthy carriage bringing in people who were going to stay there, we see folks in very fancy dresses, men in top hats,” Castellano said. But one of his most accurate sources was architect Thomas Walter, who was hired to build Greek revival cottages for the hotel's owner in 1833. Castellano said Walter rendered watercolors of the Brandywine Springs hotel as well as his other projects. “When he set his hand at the canvas, you had a near photographic record of what was there because we can compare his other perspectives to existing buildings,” Castellano said. Walter’s other projects included the Girard College for Orphans in Philadelphia, and the dome of the U.S. Capitol building – all done in what was called Greek revival style. And Castellano says that style was popular for hotels not just in Delaware and Pennsylvania but in other places like Clarendon Springs, Vermont. “They were usually two to three stories, had columns - whether they were Greek revival or federal - and they all shared that large veranda, maybe two verandas if it was a two-story building,” Castellano said. Ciosek - from the Brandywine Springs Park Friends’ group - says the resort attracted socialites and politicians seeking an escape from the city for the respite of the country. He says visitors were drawn by the springs and its purported benefits. "They had a saying in those times when they were having the big hotel, that you couldn't have somebody bring the water to you, you had to go to the water and drink it there," Ciosek said. “They had a saying in those times when they were having the big hotel, that you couldn’t have somebody bring the water to you, you had to go to the water and drink it there,” Ciosek said. And going to the water meant climbing a massive hill, going up and down 60-80 steps a few times a day. But while guests trekked great distances to drink the spring water, running water was pumped into the hotel from a nearby reservoir: a big innovation for 1834. This was another of Castellano’s discoveries. The water source made way for a new luxury: indoor swimming pools. Economic depressions in the late 1840s and 50s caused the business to suffer and the hotel was rented to a boys’ military school. Then a chimney fire burned it to the ground in 1853. Ciosek says a new hotel was created by connecting three homes on the property. The prestige of the spring water was wearing off. “This popularity just went down the tubes,” Ciosek said. Philadelphia superentrepreneur Richard Crook had a new vision for Brandywine Springs: as an amusement park. 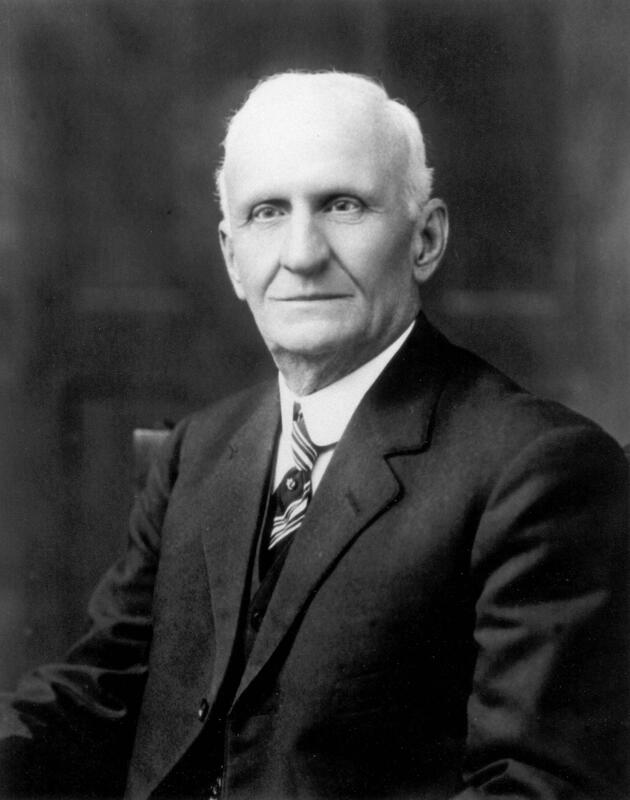 Philadelphia entrepreneur Richard Crook believed the business could prosper again with re-branding. For an 1887 grand opening, Crook decided to leave the springs behind as a hokey reminder of the past. They were absent from his first advertisements. The amusement park business took off, and Crook began adding more and more features. “He said: wow, I’m making more money from the amusement than I am for the hotel,” Ciosek said. The Council Oak played a key role in Crook's rebranding efforts. 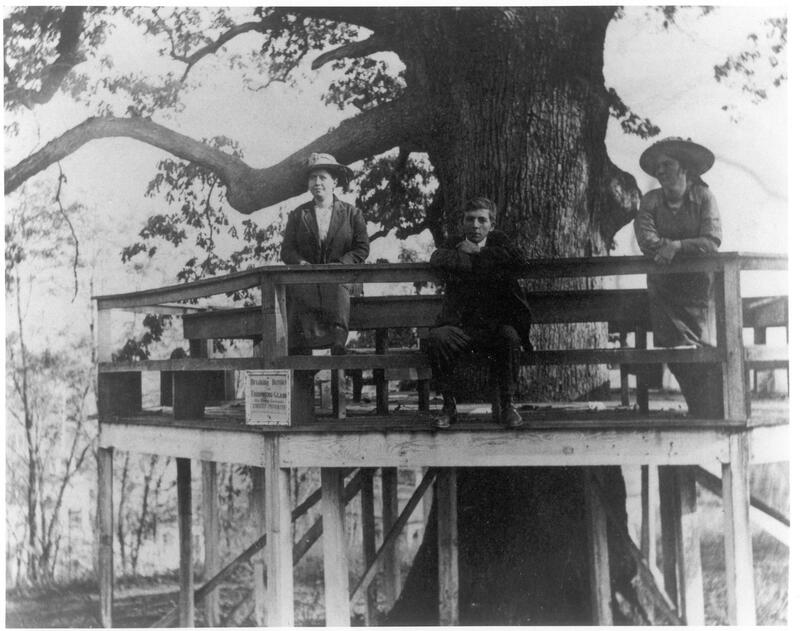 But Crook’s advertisements still took advantage of nature: specifically an oak tree he called Council Oak. Castellano says the tree allegedly has historical importance as the site of a war council held by George Washington before his troops engaged the British in the Battle of the Brandywine. But that’s never been confirmed. Castellano has read through George Washington’s letters and says the war council could have been held in Elsmere, Newport or somewhere else nearby. “We think the proprietor of the amusement park, who was a very, very good promoter, we see that legend starting to be used in newspapers about the time he’s starting to really mark the amusement park,” he said. Crook’s branding of the park’s connection to George Washington didn’t stop there: he created an artificial seven-acre lake, which he called Lake Washington. Crook’s focus was on attracting a new clientele: weekenders instead of the wealthy elite. “Then he determined: he had to get people here,” Ciosek said. And a new 19-mile railroad line running from Wilmington to Landenberg, Pennsylvania that began in 1871 helped - allowing easier access to the amusement park. Ciosek says guests no longer needed to travel via stagecoach to reach their destination. Eventually, hotels started popping up along train stops. Train stations were required to build them at each major stop to provide accommodations for guests, since the trains of that era didn’t have sleeping bunks. In 1891, the park entered into an agreement with the Philadelphia division of the B. & O. Railroad Company. “People that came on the railroad would have to get off at Faulkland Station, which was down Faulkland Road. Well, with the station here, they could get off right in the park,” Ciosek said. A new pavilion was built to accommodate waiting train passengers, and modern electricity was installed. The trolley was also Crook’s brainchild. Because people complained that the train was still too expensive, he decided to start his own trolley car that would take people to the park: called the People’s Railway. At the turn of the century, small powered boats were also added to Lake Washington the same year the People’s Railway began. Electricity brought many other improvements, lighting up the grove and a huge electric sign marking the entrance of the park. Many additions were made to the park over the next two decades. But one advanced – the advent of cars – didn’t help the park’s business -- instead ushering in its demise. "Really the great period of the amusement park was in about 1900 to 1910 and then the automobile started and people started getting cars and they could go to other places," Ciosek said." People began driving to the beaches, which replaced the amusement park as a vacation spot. The intricate past of the Brandywine Springs Park was buried and forgotten for decades. But the park got a second chance in the 1950s, when it became the first intentional state park in Delaware. “There was a group of Brandywine Springs citizens group that lobbied the legislature to make this a state park,” Ciosek said. But once the state park system evolved and grew, it was relegated to the New Castle County park system in 1970. “Because in Delaware, once you have a park it’s very difficult to get rid of it,” he said. Then in the 1990s, the Friends of Brandywine Springs group – of which Mike Ciosek is president – started digging around, figuratively and literally - teaming up with local archaeologists to excavate the old amusement park. They’ve been digging at the site of the chalybeate springs for over five years now – part of a nearly invisible village beyond the trees near the Red Clay Creek. In next month’s History Matters, she’ll take us behind the scenes of the Brandywine Springs Friends group – and their efforts to keep history alive through a series of archaeology digs orchestrated alongside other community partners like New Castle County and professional archaeologists. Delaware Public Media's Megan Pauly reports on a new federal grant supporting improvements on a historical First State house. The Read House in New Castle will be getting some upgrades thanks to a new federal grant. A unique piece of Delaware’s African American history has been uncovered: the graves of five soldiers who served in the Union army's Colored Troops during the U.S. Civil War. There was a time on the Delmarva Peninsula when passenger trains took people up and down the spine of the First State. Delaware Public Media's Megan Pauly explores the history of the historic Wilmington & Western Railroad. DPM's Megan Pauly reports on the evolution of Wilmington's annual August Quarterly and its importance in the African American community. The August Quarterly – an important annual event for African Americans – starts this weekend. During the industrial revolution and into the WWII era and beyond, shipbuilding played a key role in the evolution of industry and livelihood in Wilmington. While the shipyards that dotted the waterfront are no longer in existence, the dockyard culture is still alive and well through the Kalmar Nyckel’s crew that maintains and sails a 1600s model ship for tourists and educational purposes. In this month’s History Matters - produced in conjunction with the Delaware Historical Society and the Kalmar Nyckel Foundation - Delaware Public Media’s Megan Pauly tells us more about the history of shipbuilding in Wilmington. Delaware Public Media's Megan Pauly examines ships and shipbuilding on Wilmington's Riverfront in this month's History Matters.